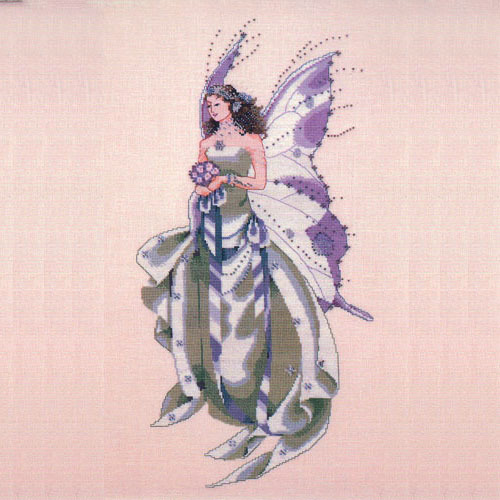 Fourth in Nora Corbett's "Year of the Fairies" Collection, July's Amethyst Fairy captures a radiant fairy mere moments before she is to meet with her long-awaited fairy prince. Because even enchanted glens get warm in July, her shadow-hued gown is off-the-shoulder satin, accented with precious gems the color of the midsummer sky. Her bouquet? Rarest lavender roses. And behind her, airy wings flutter majestically, shimmering with violet amethysts - amethysts as perfect as this moment. 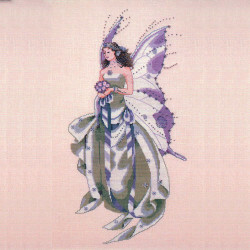 Design size: 9 1/2" x 18 1/2" with a stitch count of 149 x 295 stitched over two threads. Kit also available without fabric (£43.50), without DMC threads (£44.00), without chart (£46.00) or without both fabric and chart (£33.50).